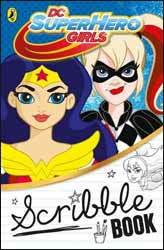 The DC Super Hero Girls: Scribble Book (2017. 160 pages) is an activity book based on the show, published by Puffin Books. The book is predominantly designed for the user to fill the book in in various ways with colour pencils. The quality of the paper isn’t that great, so I suspect that felt tips are likely to bleed through to the next page. It’s a moot point as the book is not supplied with any pencils. One of the main selling points of the show is the bright vibrant colours so it's a bit of a disappointment that the internals of the book are quite grey. I know that you are supposed to add your own colour, and once the book is filled the overall effect would look more appealing, but without even a hint of internal colour the book does not feel as inviting as it could be. On the plus side, there are a lot of different activities contained in the book. It presents not just pictures to colour in but a healthy dose of puzzles and pencil games. Overall, the book is designed to bring out the best creative side of your child and I think that it would be a welcome distraction to a five to seven-year-old girl.